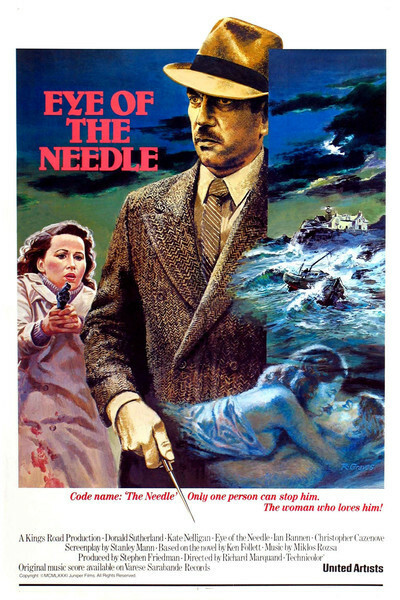 “Eye of the Needle” resembles nothing so much as one of those downbeat, plodding, quietly horrifying, and sometimes grimly funny war movies that used to be made by the British film industry, back when there was a British film industry. They used to star Stanley Baker or Trevor Howard. This one stars Donald Sutherland, as the kind of introverted psychopath who should inhabit only black-and-white movies, although the color here is sometimes gloomy enough to suffice. I admired the movie. It is made with quiet competence, and will remind some viewers of the Hitchcock who made “The Thirty-Nine Steps” and “Foreign Correspondent.” It is about a German spy, the "Needle," who dropped out of sight in Germany in 1938 and now inhabits a series of drab bed-sitting-rooms in England while he spies on the British war effort. He is known as the Needle because of his trademarked way of killing people by jabbing a stiletto into their rib cages. He kills with a singular lack of passion; this is Jack the Ripper crossed with J. Alfred Prufrock. As played by Sutherland, the Needle is a very lonely man. We are given hints to explain his isolation: He was raised by parents who did not love him, he was shipped off to boarding schools, he spent parts of his childhood in America, where he learned English. None of these experiences fully explains his ruthlessness, but then perhaps it is just a spy's job to be ruthless. The plot is part espionage, part cliff-hanger. The Needle discovers phony plywood "airplanes" intended to look, from the air, like Patton's invasion force, a ruse to throw off the Germans. His assignment is to personally deliver news of the actual Allied invasion plans to Hitler. This he intends to do with every fiber of his being, and yet we never get the feeling that the this man is a patriotic Nazi. He is more of a dogged functionary. In his attempts to rendezvous with a Nazi submarine, he's shipwrecked on an isolated island occupied only by a lighthouse-keeper and by a young married couple, a woman (Kate Nelligan), her legless husband (Christopher Cazenove), and their son. The last third of the movie turns into a bloody melodrama, as the Needle kills the husband and the lighthouse-keeper and threatens the woman, first in a psychological way and then with violence. But before the final standoff, he pretends to be merely a lost sailor. And the woman, frustrated by her husband's drunkenness and refusal to love, becomes attracted to the stranger. They make love. She grows fond of him. Does he grow fond of her? We can never be sure, but he tells her things he has told to no one else. Some people will find the movie slow going. I preferred to think of it as deliberate. It is effective, I think, to develop a plot like this at a deliberate pace, instead of rushing headlong through it. That gives us time to meditate on the character of the Needle, and to ponder his very few, enigmatic references to his own behavior. We learn things about him that he may not even know about himself, and that is why the film's final scene is so much more complex than it seems. "The war has come down to the two of us," Sutherland tells Nelligan, and in the final exchange of desperate looks between the man and the woman there is a whole universe left unspoken. The movie ends with Nelligan regarding a man who is either a treacherous spy or an unloved child, take your choice.